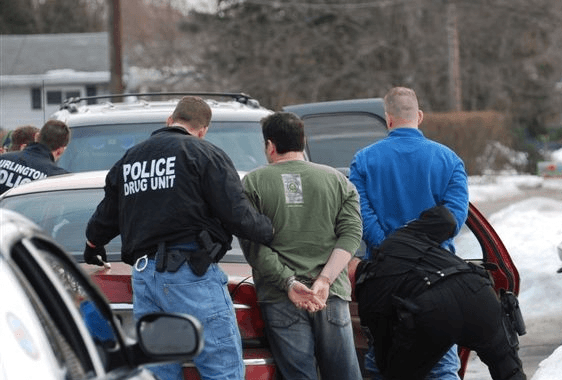 If a Massachusetts law enforcement agency infringed on your constitutional rights in connection with a criminal arrest, we would like to know about it. Our law firm focuses on state criminal defense in Massachusetts. Every day and every week, we are hard at work standing up on behalf of our clients before government agents of all kinds, including prosecutors and judges — insisting that we will not let unconstitutional search and seizure tactics slide by when our clients have been criminally charged as a result. Boston Criminal Defense Attorney Topazio is prepared to advocate zealously on your behalf if you have been charged with a crime in Massachusetts as a result of illegal search and seizure tactics. The client, a 25-year old unemployed laborer, was arrested by Malden Police when he walked into a home during the execution of a search warrant. The client was charged with knowingly being present where heroin is kept after the Malden Police found several bags of heroin in the home they were searching. The client hired Boston Criminal Attorney Steven J. Topazio to represent him after his initial attorney was unable to resolve the case. Attorney Topazio realized that the client was not the original target of the police investigation. Malden Police had focused their investigation on another individual allegedly dealing drugs out of a home in Everett, Massachusetts, where a lot of complaints from neighbors about drug use were made and a lot of foot traffic was occurring. The Malden Police utilized a confidential informant to obtain information about the distribution of illegal narcotics for the home. The confidential informant made a controlled buy of heroin for police, and obtained a search warrant. Thirty minutes before police executed the search warrant, the client was observed entering the premises. When Malden police entered the Everett home on the authority of the search warrant, they seized several items, including plastic bags containing heroin in the room the client was found in. Attorney Topazio argued that there was insufficient evidence to establish that his client knew that he was in the presence of heroin so he pushed the case to trial. On the day of the trial, Attorney Topazio was successful in persuading the Judge to place his client on a period of pre-trial probation for six months, despite his client’s extensive criminal record. Result: Case to be dismissed after period of pre-trial probation. The client, a 36 year old construction worker, was arrested after police alleged he was observed to be involved in a drug transaction, but when the alleged buyer disappeared into a building, the client was stopped, searched and found him to be in possession of cocaine, hired Boston Criminal Lawyer Steven J. Topazio to represent him. Attorney Topazio filed a motion to suppress the evidence in the case after the warrantless search, claiming the police lacked probable cause to search his client. The facts in this case indicated that the police hustled up to the client’s car when it was stopped at a red light, and ordered him out of his car and pat frisked him for weapons. During the pat frisk, and without manipulating the item, the police immediately recognize an item in the client’s shirt pocket to be cocaine. After an evidentiary hearing at which the Boston Police testified, the court found that the stop of the client was not supported by reasonable, articulable suspicion of criminality. The court also found that contraband nature of the drugs in the defendant’s pocket was not immediately apparent until manipulated in some fashion, which violated the client’s rights, and as a result, the court allowed the defendant’s motion to suppress evidence. Result: Case dismissed after all evidence suppressed. The client, a 64 year old Army Vietnam War Veteran, was arrested for possession of heroin, was represented by Boston Criminal Defense Lawyer Steven J. Topazio. Attorney Topazio filed a motion to suppress to challenge the seizure of heroin and evidence found on his client. A motion to suppress is a formal, written request to a judge for an order that certain evidence be excluded from consideration by the judge or jury. Without the evidence of the heroin to use at trial, then the prosecutor will not have evidence to convict the client. According to the police report, the State Trooper saw the client leave his motor vehicle, enter a building in an area known for its high level of narcotics activity, and when the client exited the building within one minute, he was approached by the Trooper who stopped him and illuminated him with his flashlight. When the client recognized the Trooper as a police officer, the Trooper told the client to give up the drugs so you don’t make a scene. The client was charged with possession of heroin. Today, after arguing his motion to suppress, Attorney Topazio convinced the prosecutor that this warrantless search was not consensual, without probable cause, and violated his client’s rights. The court agreed and the case was dismissed. The client, a 28 year old father of two, was arrested after State Troopers stopped the client’s motor vehicle after the Troopers concluded that they witnessed a street level drug sale, was represented by Boston Criminal Attorney Steven J. Topazio. Attorney Topazio attacked the case by filing a Motion to Suppress evidence arguing the motor vehicle stop not based on reasonable suspicion. According to the police report, the Trooper states that his attention was first drawn to two males described as “sickly looking males pacing back and forth” and to be “nervous and looking around.” The troopers saw nothing exchange between the parties to conclude a drug transaction had occurred. Nevertheless, the troopers after approximately ten minutes watching these individuals state in their police report that they see a “white female who they know to be a drug user, prostitute and person who middles narcotics deals in the Shirley Ave area of Revere”. According to the police report, the two males and this woman begin to quickly walk down Beach Street towards North Shore Road. At North Shore Road the two males split away from the female and walked towards the beach. The female gets into a white van the client was driving. The van thereafter pulled away from the curb. At no time does anything else happen. Nothing is observed passed. No furtive motions of any party are mentioned. Where the white female comes from is not mentioned. The trooper merely concludes that he “suspected that there was a narcotics transaction about to take place”, stopped the van and discovered cocaine in the van. Attorney Topazio argued that the motor vehicle stop not based on reasonable suspicion. Attorney Topazio pointed out that even if there eventually was reasonable suspicion when the troopers saw a piece of torn plastic baggie on the floor of the van, the troopers did not have reasonable suspicion before pursuit began, as required by law, citing Commonwealth v. Stoute, 422 Mass. 782 , 788-789 (1996). Today, Attorney Topazio was able to persuade the Commonwealth to reduce the charges and obtain a six month CWOF for his client on the lesser included offense of straight possession. Result: Motion to Suppress results in reduction of charges and client accepts a six month CWOF for straight possession. The client, a senior at Babson College, was arrested after police from the Suburban Middlesex Drug Task Force executed a search warrant on the client’s home, after completing an investigation involving several undercover purchases of marijuana of approximately one ounce per buy from the client, over the course of several weeks, hired Boston Criminal Drug Attorney Steven J. Topazio to represent him. Boston Criminal Attorney Topazio obtained the return on the search warrant and learned that several pounds of marijuana, a digital scale, large sums of US currency, several smaller bags of marijuana, a heat sealing packaging machine, and numerous plastic bags used for packaging were seized from his client’s home. Boston Criminal Lawyer Topazio mounted a defense of trying to suppress the drugs by challenging the search warrant. Massachusetts Defense Attorney Topazio analyzed his client’s case which consisted of three undercover police buys of marijuana directly from the client himself at his home. The undercover police buys of marijuana were the basis of the evidence presented to for the magistrate for the issuance of the search warrant. Massachusetts Criminal Attorney Topazio filed discovery motions and prepared a motion to suppress with memorandum of law to challenge the search warrant. During the course of negotiations, the client agreed to tender an admission to sufficient facts but wanted to avoid jail time and a conviction at all costs. Today, Massachusetts Criminal Defense Lawyer Topazio persuaded the court to give his client a CWOF on three counts of distribution to an undercover officer and one count of possession with intent to distribute despite the Commonwealth’s recommendation of a guilty finding and a two year suspended sentence. A CWOF had the further benefit of not causing his client’s driving privileges from being suspended. Result: Client avoids jail and a conviction on his CORI by admitting to sufficient facts and receives a CWOF on all counts. The Client, a 31 year old self employed medications courier for nursing homes, was arrested on drug charges, hired Boston Criminal Defense Lawyer Steven J. Topazio to represent him. According to the police report, the Client was stopped in his motor vehicle after a State Police Trooper alleged the Client’s rear motor vehicle plate light was broken. When the Trooper approached the vehicle, the Trooper claimed he detected a strong odor or raw un-burnt Marijuana. According to the report, the Trooper asked the Client if there was any Marijuana in the vehicle and how much. The Trooper reported that the Client stated that he had “an ounce,” then produced 3 small plastic bags containing 1.37 ounces of Marijuana. An ounce or less of marijuana is a non-arrestable civil violation. An ounce of marijuana or more is a criminal offense. Attorney Topazio attacked the Trooper’s rendition of the facts as not being credible. Attorney Topazio alleged the Trooper threatened his Client and forced the Client to produce the Marijuana that was secreted in the motor vehicle. Attorney Topazio argued that due to the recent changes in the law which decriminalized an ounce of marijuana or less, the police can no longer search a motor vehicle based on an odor of marijuana alone. Today, Attorney Topazio persuaded the District Attorney to dismiss the charges against his Client on the payment of court costs.